The AOA conference traditionally winds up with an address by a British airline CEO. To put things into perspective, Flybe in 2017 carried 8.8m passengers at a load factor of 69.6%, down from 72.6% in 2016, and made a £48.5m loss. It plans to reduce its current fleet from 85 to 70 aircraft by 2020. 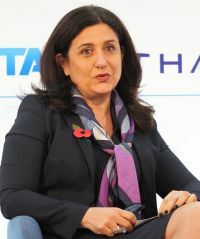 Ourmières-Widener was able to discuss the airline’s piloting situation, which she described as “difficult”, noting Flybe was the only British airline to train its pilots in-house. “Fortunately, with our route structure, we can offer an appointment that brings staff home every night. It is one of our strengths”. See also COMMENT: Is Northolt the saviour for Flybe? in this issue.